1980s Amanda has no idea she had it so good. She was living it up on a hobby farm with a pet goat and a pet goose, rocked some epic 80s sundresses and had access to the occasional piece of Mum-made Cherry Ripe slice. So pretty much living the dream. Now 2010s Amanda has things pretty sweet but one thing she was missing was the perfect 80s sundress. Oh and the pet goat. But that isn’t the focus here. We’re talking 80s. We’re talking sundresses. And we are talking the return of the 80s sundress – check out its majesty! This pattern is the Josie Dress (aka Robe Josie) from Republique du Chiffon. It is the total epitome of what I want in a sundress this year – a little bit 80s but with a whole lot of fun. It has a fitted bodice featuring princess seams and angled waistband, a button up front, slash pockets, tulip skirt and crossed shoulder straps. So… pretty much perfect. When I stumbled across this late one night while doing some very important research (read: style stalking awesome sewists’ blogs) it was love (and purchase) at first sight! 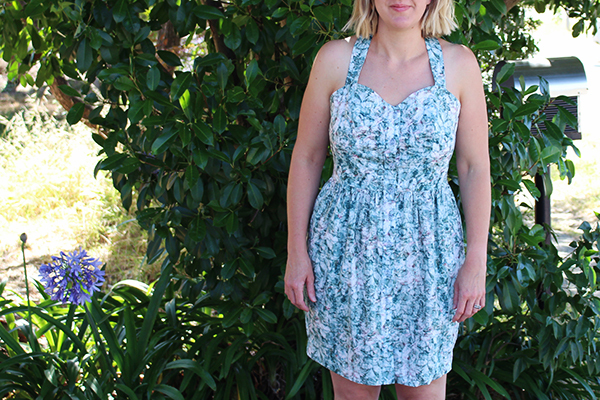 The fabric is a simply lovely Liberty lawn called Tiers of Light. The lovely folks at The Fabric Store very kindly provided this one to me gratis (thank you guys!) and I grabbed a piece of the teal colourway. Just like the other Liberty I have worked with this was a dream – like sewing together pretty pieces of cloud. The only complaint I have about this fabric is that it is so dang hard to photo. Yup. Lamest. Complaint. Ever. Construction wise, this went together pretty easily. This was my second version of the Josie (the first made in bits and pieces when I was sick and on painkillers. I’ll share that one in the future!) so I had an idea of how I wanted it to go together. I added fusing to the button bands, fully lined the bodice and lengthened the pattern by 8cm. Yup. You read that right. When I first measured off the pattern pieces this frock was set to mini level. I mean, I’m a little above average height (5’8”) but this design made me feel like Godzilla. FEAR MY MIGHTY SEWASAURUS POWERS! 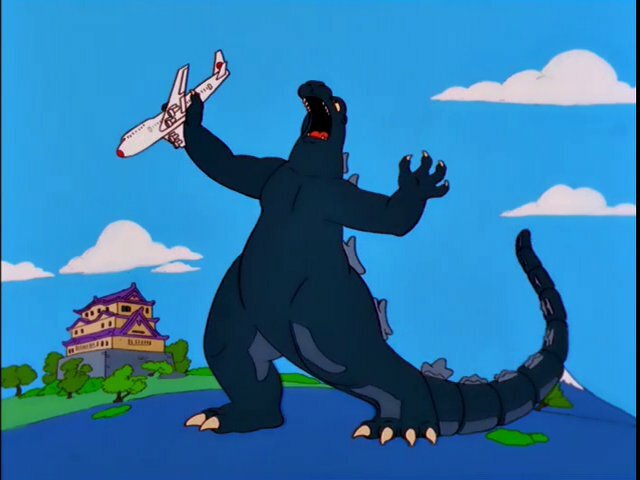 Image that accurately reflects me as Godzilla dealing with fitting issues. Courtesy of The Simpsons. Feel the 80s power! Seriously. I think it is the bodice design paired with the gathering that makes this all kinds of rad. The bodice details. The princess seams and the angled waistband are so much fun to put together. It’s like a jigsaw puzzle for ladies who sew. And like their jigsaws to have only six pieces. Bwah ha ha! The Liberty. This is just as awesome to sew with as I remember. I mean, sure there are no pirate ships on this frock but it is still all kinds of fierce! Wear the right underpinning when fitting. Such a rookie mistake. Hopefully this does not mean Hufflepuff will lose five points in the Sewing House Cup! I really can’t think of anything else. I am seriously in love with this pattern. Like crazy heart eye emoji love! Pattern: Robe Josie by Republique du Chiffon and yes you can get an English language version. I scored mine from Stitch 56 because instant gratification is sometimes a thing I do. Bwah ha ha! Fabric: 1.5m Liberty lawn Tiers of Light in Teal provided by the rad folks at The Fabric Store, 0.5m white lawn from my stash, 0.5m blouseweight interfacing from my stash. Adjustments: Bodice fully lined, skirt lengthened by 8cm, extra button added and button holes moved. Overall, this is a freaking cute sundress. It is so lovely and cool to wear and has been perfect in the bananas 39 degree days we have been experiencing in Canberra this week. Which would be fine if our house had more than one ceiling fan. Which it does not. And I may be spending a lot of my spare time sitting in a wading pool with the dogs (but sans cat as she was not impressed when I tried to cool her down). Hopefully the temperature drops again soon so I can get back in my sewing room because I want to sew a blazer. In the middle of summer. Because apparently I have gone crazy with the heat… Wish me luck! Super cute! I’m pretty sure I had something similar when I was a kid haha. Liberty is the best in the heat, which I agree has been crazy! Isn’t it super 80s? I have totally jumped aboard the Liberty train in this weather – I understand now! Super fantastic gorgeous. As close to perfect as is humanly (or reptillianly) possible! This lizard lady is enjoying beating the heat in Liberty! I shall be the classiest dinosaur in the land! Thank you 😀 I am so stoked with this one and have been wearing it so much lately! Liberty frocks for all in this weather!! The fabric is so crazy lush – I am generally not a huge fan of the Liberty due to the prints being a bit tiny but this was all kinds of awesome! We would be the coolest twins ever! The weather has been bananas, Sam! I think we all need to have lovely Liberty flocks for this weather! What a lovely dress! I used to have a similar one… in the 80s. I’m tempted to make this one for next summer. We’re now in the coldest days of winter. I love it! I love it on you, too, and I could totally imagine how delicious a dress like that in a beautiful high-quality liberty cotton would be in the heat you guys have been having. I’m not a great fan of liberty either due to the small prints, but that definitely is the print to get if you are going to go liberty! 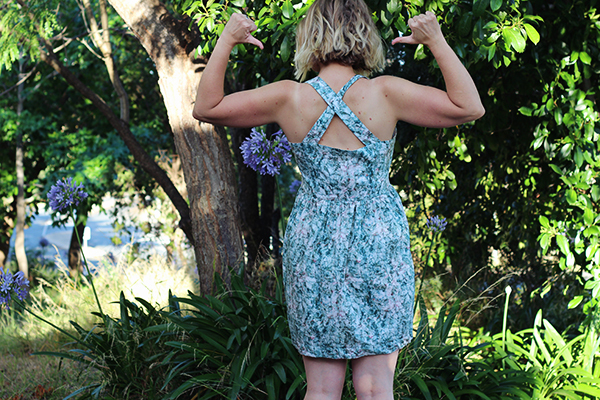 Love the blog, the dress, the fabric and Machi Koro!! 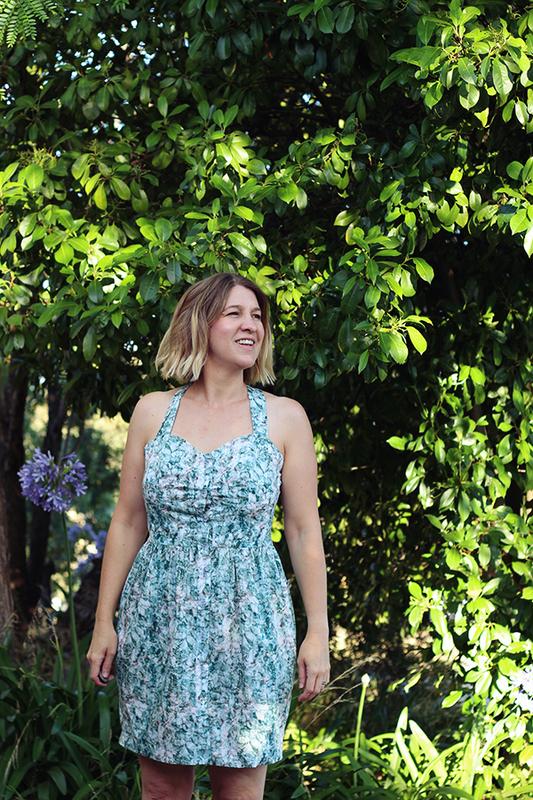 Inspired to get sundress stitching – ninetees inspired for my golden cherry ripe eating years – and get the family onto a card game stat! I’m sure there’s a picture floating around somewhere of me as a child rocking a similar dress styled with a turtleneck underneath! oooh yeah! The 80’s rocked! 80’s Amanda is totally jealous of 2017 Amanda! !